LONDON (AP) -- In Britain, there is a growing sense of Brexit deja vu. Two years after the country voted to leave the European Union, emotional arguments about membership in the bloc are raging as fiercely as they did during the 2016 referendum. With seven months until Britain officially leaves the bloc, negotiations faltering, chances are rising of an acrimonious divorce — and the one thing that pro- and anti-EU forces have in common is that they are both unhappy. Former U.K. 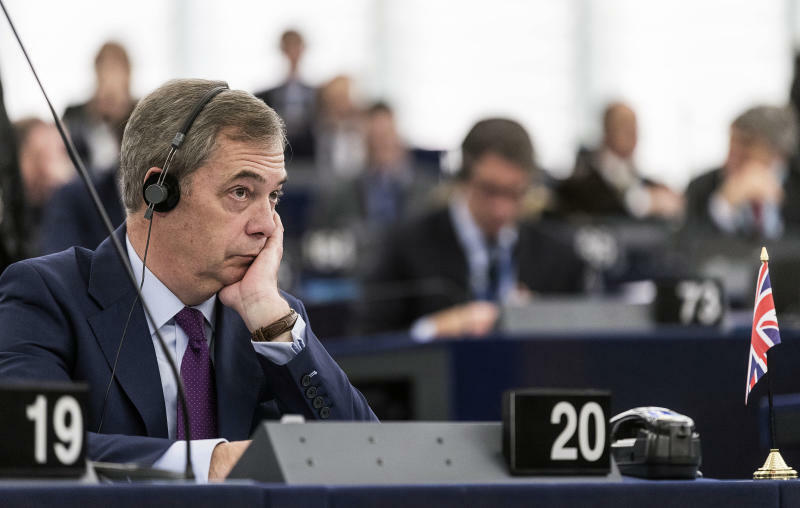 Independence Party leader Nigel Farage announced Saturday that he was returning to political campaigning in a bid to derail British Prime Minister Theresa May's plan for future ties with the EU. Farage, the right-winger who helped lead the successful "leave" campaign in 2016, wrote in the Daily Telegraph that he would join a cross-country bus tour by the group Leave Means Leave to oppose May's "cowardly sell-out." Referring to U.K. politicians and civil servants, he said "unless challenged, these anti-democrats will succeed in frustrating the result" of the referendum. Negotiations on future relations between the U.K. and the bloc have faltered, largely due to divisions within May's Conservative government over how close an economic relationship to seek with EU. Last month the government finally produced a plan, proposing to stick close to EU regulations in return for free trade in goods. That infuriated Brexit-backers such as Farage and former Foreign Secretary Boris Johnson, who say it would leave the U.K. tethered to the bloc and unable to strike new trade deals around the world. Opponents of Brexit say that, even if the EU accepts May's plan — which appears unlikely — it would still erect barriers between Britain and the EU, its biggest trading partner. Meanwhile, time is running out. Britain and the EU say they aim to hammer out an agreement on divorce terms and future trade by October — or, at the latest, December — so that it can be approved by all individual EU countries before the U.K. leaves the bloc on March 29. This week Latvian Foreign Minister Edgars Rinkevics put the chances of getting a Brexit deal at 50-50, a figure echoed by other EU leaders. U.K. businesses, however, have warned strongly that leaving without a deal could cause mayhem for trade and travel, bringing higher food prices, logjams around U.K. ports and disruption to everything from aviation to medical supplies. The U.K. government says it remains confident of reaching a deal, but is preparing for a "no deal" scenario. Anti-Brexit campaigners are urging a second referendum on whether to accept any agreement that is reached. The idea is opposed by the government but supported by a growing number of politicians, trade unions and groups including the British Medical Organization. Bob Kerslake, a former head of Britain's civil service, said Saturday that the consequences of leaving the EU without a deal were so serious that Brexit should be put on hold if agreement wasn't reached. "If the government can negotiate a good deal, then so be it," he told the BBC. "But if they can't and we end up in this position, then we have to reopen the question of whether we go forward with Brexit at all. It is not too late to do that."